We are engaged in offering exclusive and exquisite range of Foots Oil. Our range of Foots Oil is widely demanded all across the globe. Foots Oil or Residue wax is a by-product of petroleum. 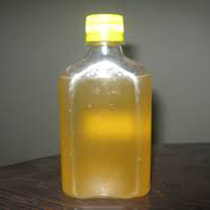 Foots Oil offered by us is obtained when oil is sweated out of slack wax. This foots oil takes its name from the fact that it goes to the bottom, or foot, of the pan when sweated. The Foots Oil, we provide, comes in various invigorating aromas which helps you relax and refresh.